/Company Departments /Discussion Groups /Projects & Tasks /Manage Modules & Settings /How Can I Merge Teams in Mangoapps? What will happen if the module in the merged team is not enabled in the destination team? What will happen to the task module when I merge it into a group or department? What will happen to the Home Page during conversion? What will happen to the title and description of the merged team? Where can I check who has merged which teams? What will happen to content that has the same name in both the teams? In order to merge two teams together, you need to be the admin of both teams. Click the more icon on your team’s page. You’ll see a merge option. After clicking merge, the following popup will appear. The merge team name is already selected. 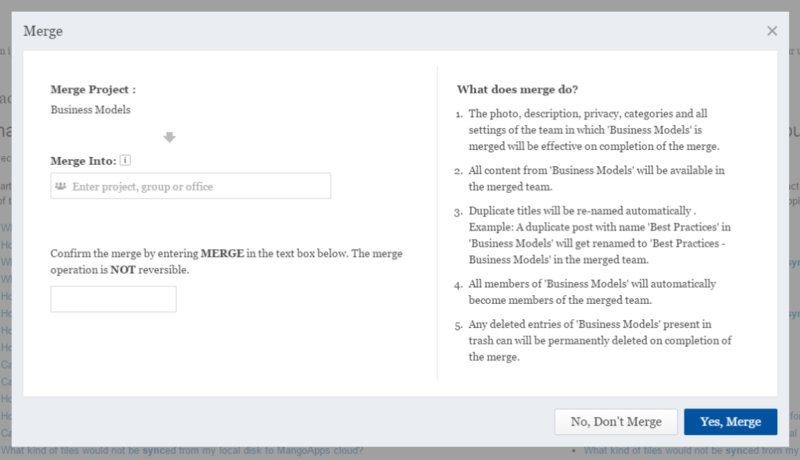 As you enter text into the Merge Into box, the teams which you are an admin of will appear and you can select the team that you want to merge. Enter MERGE in the text box to confirm. Read about what merge does and click “Yes, Merge” when you’re ready. A processing message will show and a feed is posted in the destination team. After the two teams are merged, the admins become admins of both teams and member rights remain applicable. When a team is merged all its content is imported to the destination team and no content is lost. If the module is not enabled in the destination team, then the content from the merged team will appear as soon as the module is enabled in the destination team. The project tasks will be seen in a task interface in the group or the department. Also, the user will be able to complete the task life cycle, but the user cannot create additional tasks in the group or department. The homepage of the merged team will appear in the destination team with a time stamp. They will be lost. The destination team’s description and title will remain. We have made an entry in the audit log with the member name of who has merged the team. We will attach the team name to the content of the merged team while merging it in the destination team.